While not a class of gladiator as such, the parmularius gladiators were any gladiator that had a small shield known as a parma. The plural of this gladiator class was parmularii, and the opposite of this class were the Scutarii, who carred a shield known as a scutum, much larger in size than the parma shield. The shield used by the parmalarius gladiators was called the parma, and was typically around 36 inches in diameter, which is about 90cm which is quite small for a shield. The parma was an iron framed sheiled with a central boss and a handle on the rear to hold it with. The parma was used by Roman soldiers known as legionnaires origionally but later they changed to using hte much larger but heavier scutum. The parma however still held favour with certain Roman troops and units, typically horsemen, cavalry where its lighter weight was beneficial when on horseback. 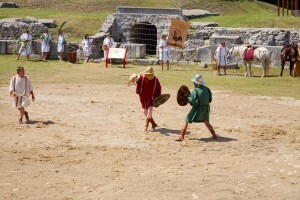 Two parmalarius gladiators, both from the eques class wielding parma shields. 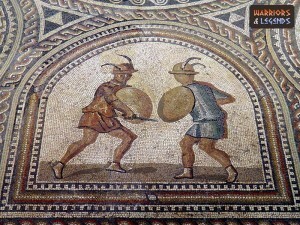 A mosaic depicting two eques gladiators, both in the parmalarius parent class.